A friend on Project Runway! Here is a fun post. Lately I've had not much positive to say about television and today's media and entertainment industries. So now I have something that begs me to say something and it's a very positive thing for a change! I had no idea for the longest time that a friend of mine (I used to live just downstairs from him in Manhattan) was on TV. 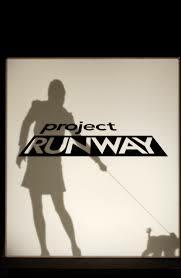 Actually, on Project Runway which I actually like. Which says a lot for me since I don't even currently have TV because I'm just "over it", even the news seems like such crap these days. Yes, people think that's kinda weird, but honestly even if I liked TV, I don't have time to watch it . . . way way way too busy. So anyhow . . . getting back to the point! I can't say what this person is like on Project Runway (since I haven't seen it yet!!) but I can tell you this person was one of those unique talents. I had been to a couple showcases of said designer while in NYC (said person was still a design student at the time). One time I was at a fashion show that was featuring the best of the city's student designers. Well, I can say that night, this Project Runway challenger's stuff was like magic, a distant winner. Not only that, it was clever too! Know who I'm talking about? I'll reveal tomorrow! Hey Dr. David, I hope you will reveal your surpirse Project Runway friends soon!